For all that we’ve technically been sailing inside the Great Barrier Reef for several weeks, the reef itself has always been invisibly far out to sea. 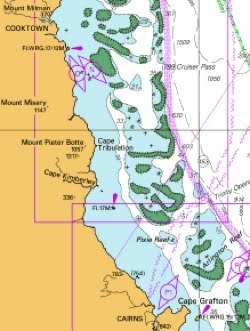 From here northward, though, the Barrier comes close inshore and is a navigational force to be reckoned with, comprising hundreds of scattered reefs lurking invisibly just below the waves. There is a well-charted and waymarked shipping channel to ease navigation, but it is full of large ships moving ore and containers up and down the coast. After weeks of dead calm, we’d been wishing for a breeze. Dusk fell, a humpback whale treated us to an aerial display in our wake, and – wonder of wonders – the wind picked up to the low twenties. Our speed increased to 6-7 knots under full sail as we entered the channel. Harriet was doing a fine job of sailing, so while Bronwyn went below to rest, I was free to sit in comfort and idly formulate an elaborate metaphor for the process of sailing through the reef at night. Imagine getting into your car to drive to the next town. First, however, you spray-paint the windows black so that you can’t see out. Then you tape your mobile phone to the dashboard and log on to Google Maps. You start the engine and put it into gear, and from now on you are completely at the mercy of the accuracy of the map and where your phone says that you are. You can be reasonably certain that all the streets and intersections are marked, as well as the more obvious light poles and roadside furniture, but you just have to deal with curbs, speed humps, rubbish bins, dogs and cats as you feel your wheels bump over them. Thankfully there is little other traffic, but you know that if you leave these twisting side-roads and venture onto the highway, you will be sharing the road with fully laden trucks. You also know that they can’t see you either, and that in any case all their brake lines have been disconnected. As I lay in the cockpit spinning this tale and watching meteorites blaze across the milky brilliance of the starry sky, Pindimara ploughing blindly into pitch darkness at close to hull speed, I thought happily that I wouldn’t trade places with anybody. The hours passed, and the wind crept up to the mid twenties. Pindimara was now quite overpowered, but there were few gusts and the swells were predictable, so I left the sails up. Harriet the Hydrovane was coping superbly, and tracking better than ever before; I was really coming to appreciate the Hydrovane slogan ‘survive your dream’. In the early hours of the morning, deep inside the shipping lane with bulk carriers and trawlers passing on either side, the wind crept up into the high twenties and our speed to over seven knots. It was getting decidedly bouncy, so I reckoned that enough was enough and called all hands on deck to reduce sail. To say that the crew tumbled eagerly out of their bunks would be an overstatement, and when Bronwyn did clamber painfully out, she commented that her ‘rest period’ in the bucking bunk seemed to have consisted mainly of two hours of strenuous but inadvertent Pilates exercise. We quickly reduced sail and got back onto course. As is our usual practice on night passages, we’d gone straight for the main’s third reef, but Harriet soon picked up the pace to a respectable 4-5 knots. I was pretty tired by now so I gratefully put my head down while Bronwyn took a watch. At a little after 4am I took over again, and immediately got my feet wet as a wave curled over the stern. The swell was now well over 2 metres, and the wind was touching 30 knots. It had also swung around onto the beam, and even with the third reef in, we were overpowered for a reach. The wind was howling in the rigging, and the hull was thrumming and making odd little banging sounds under my feet. We were stll four hours from the safe harbour at Lizard Island, and I seriously considered replacing the main with our storm trysail for the final leg. Instead I chose discretion, and put our tail between our legs and ran for nearby Cape Flattery, which at 260 metres high looked to be big enough to hide behind. The wind was easier to manage with it behind us, but the wind speed continued to increase and of course we were now surfing down 3 metre swells in the darkness. As the Cape loomed out of the gathering dawn light, I once again roused Bronwyn who navigated us in to shelter between the Cape itself and the chart position of a sunken wreck. Anchoring for once in the light, we immediately fell into bed and slept until lunch time. Although we were snug in our bay, the 30-knot wind continues to howl over our heads. This entry was posted in Australia, Oceania, Travel, Voyage of Pindimara and tagged Gale, Great Barrier Reef, Sail on 2009/08/17 by Reinhard.